A last minute scheduling conflict at the New York Post (curse you, Tony season!) meant that my planned review of Aufstieg und Fall der Stadt Mahagonny at Manhattan School of Music had to be 86ed. But I’m not going to let that stop me from recommending this production enthusiastically. To begin with, there’s the work itself, which somehow mysteriously seems to stay younger than the youngest of topical works. 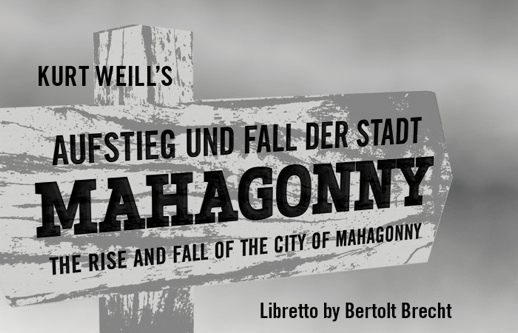 Every time Mahagonny is performed Brecht’s text and Weill’s music set up a new set of resonances: sadly, the themes of the emptiness of materialism and the (justified?) rage of the downtrodden against the status quo don’t seem to have dated at all. And it’s performed quite uniformly well, with strong student voices, principally tenor Aaron Short, who pumped out Jimmy Mahoney’s high, heavy lines all night without even trace of fatigue. There may be Wagner in this young man’s future. He was just one of a cadre of stocky bearded types who populated the City of Nets: I was waiting for a title card reading “EVEN IN MAHAGONNY, GENTRIFICATION BEGINS WITH GAY BEARS RESTORING BUNGALOWS.” Chief among the fuzzy fellows was baritone Jason Cox as the more-or-less faithful Billy, with a handsome baritone and a sweet, unassuming stage manner. There were also impressive, sinister performances from James Ioelu (Trinity Moses) and Peter Tinaglia (all the more impressive as Fatty the Bookkeeper, the first opera lead for this tenor—but they both had to play support to the massive whonking mezzo of Rachelle Pike as Begbick. Her easy access to a fat, booming chest voice was just stunning, and it wasn’t until the curtain call that one realized she has quite a pretty face: her Leocadia’s expressions properly remained in the narrow range from smug to sneering. I wasn’t quite so taken with Cree Carrico‘s Jenny. A bright lyric soprano and a drop-dead speaking voice added up to only part of a performance because her physical movement seemed to be by rote rather than organic. Still, it’s a difficult part to pull off, and I’d be interested in hearing her in a more ladylike role. The orchestra and very strong chorus were led by Kynan Johns, who took a slightly mellower stance with the piece than I’m used to hearing, almost a bel canto approach, which highlighted the really surpassing beauty of some of the quieter sections of the score. Dona D. Vaughn‘s production was maybe a little tame for 2013; Mahagonny seemed more downmarket bed and breakfast than city of sin. But the show looked slick and ran briskly and seamlessly. The idea of performing the brief second and third acts without a break paid off, too.